Much of current software engineering practice and research is done in a value-neutral setting, in which every requirement, use case, object, test case, and defect is equally important. However, most studies of the critical success factors distinguishing successful from failed software projects find that the primary critical success factors lie in the value domain. 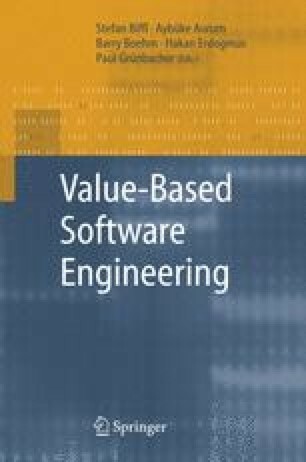 The value-based software engineering (VBSE) agenda discussed in this chapter and exemplified in the other chapters involves integrating value considerations into the full range of existing and emerging software engineering principles and practices. The chapter then summarizes the primary components of the agenda: value-based requirements engineering, architecting, design and development, verification and validation, planning and control, risk management, quality management, people management, and an underlying theory of VBSE. It concludes with a global road map for realizing the benefits of VBSE.